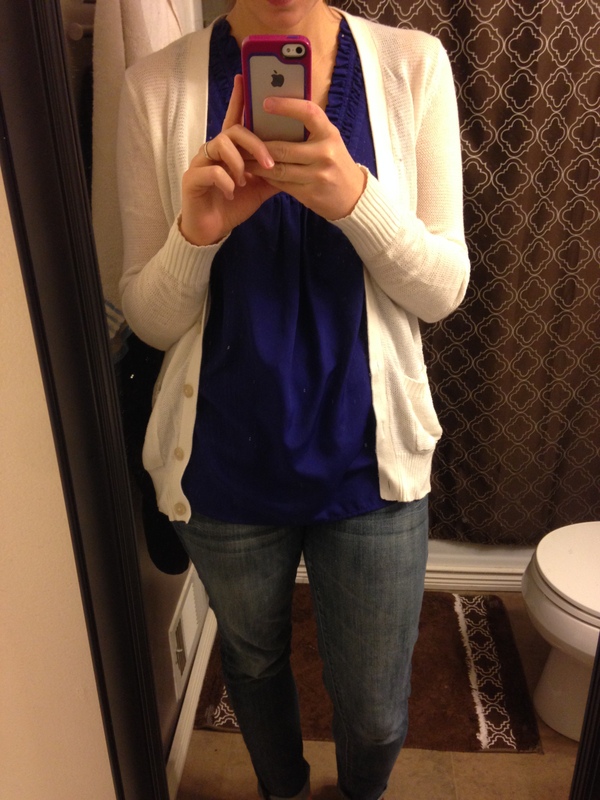 It’s time for another Stitch Fix review! Stitch Fix, for those who don’t know, is an online service where you set up a profile, pay $20 and have a personal stylist send you five curated items they think will suit your needs/wants. Once they arrive, you get three days to try things on, mix-and-match with items from your own closet, and decide what you want to keep. If you keep anything, your $20 up front goes toward your final total; if you keep everything, you get a 25% discount on the entire box. It’s super easy and, if you’re like me and hate to shop, easy is what you need when you need new clothes. Plus, referral links (like the ones in this post) get you $25 credit for each time someone orders a fix. Since I loved a couple items in my first fix, and because I had a referral credit in my account, I went ahead and ordered another. The three items I returned last time were more of a fit issue than a style issue (except that terrible mauve sweater), so I had high hopes for this box. When I opened it, I was excited to see they sent a couple casual tops, just like I asked. 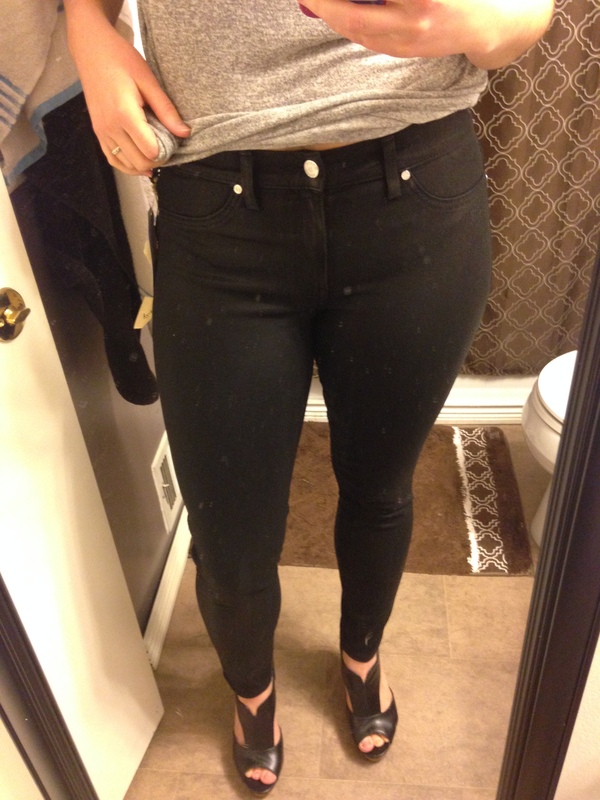 There was also a really great pair of jeans I couldn’t wait to try on: Henry & Belle, Abana Coated Ankle Length Skinny Jean. The stylist card they included mentioned they should fit better than the last two they sent, so I had high hopes for these guys! 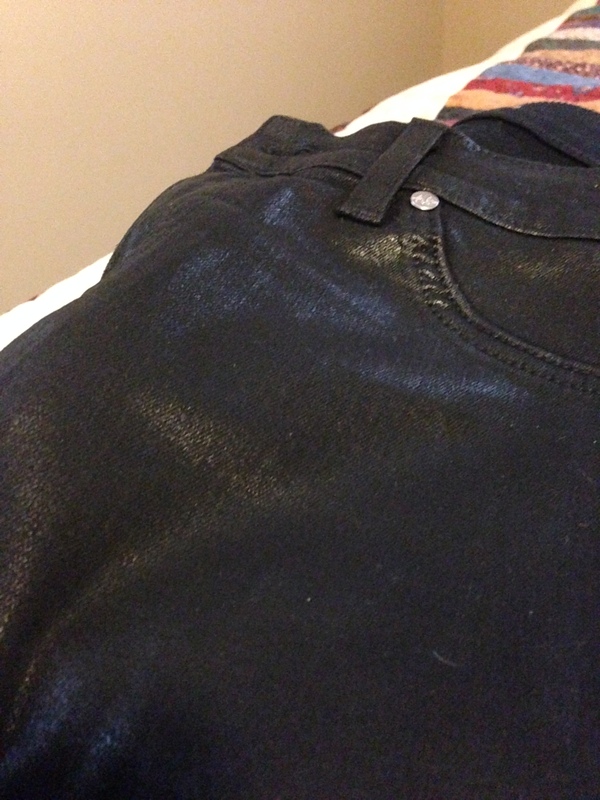 Plus, they have this really great sort of metallic/shiny look to them that makes you feel a bit rocker when you put ’em on. So like I said, high hopes. And they fit *almost* perfectly. Yeah, my lighting is terrible. Whatever. Anyway, what you can’t see in this picture so much is that while they fit great through the hips and legs, the waist was a bit … tight. I’ve got a bit of dunlap (done-lapped over my belt!) going on here, and no one needs to see that muffin top. Cost: $114. Verdict: Sent back. What you can also see in the above picture is one of the tops I was excited about: Market & Spruce, Sam Hi-Lo Short Sleeve Tee. Ugh. Muffin top, visible through that thin tee. Stupid jeans. This shirt though. 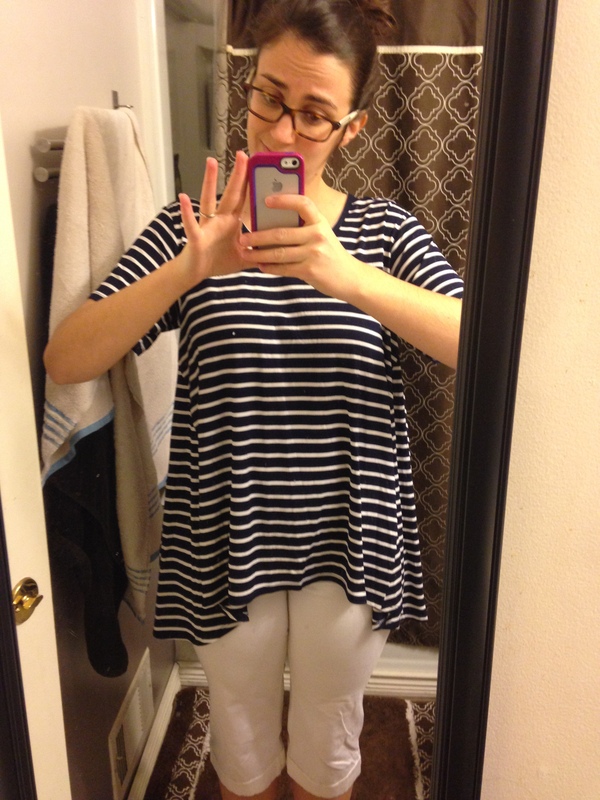 It was super comfortable, soft and a nice casual shirt you could wear just about anywhere. I liked the fact that it had a lower hem in the back, making it perfect to wear with leggings if you’re down with that sort of thing. The only downside here is that it feels a lot like some other shirts I own, and that I could probably find something similar if I wanted to for a lot less. Cost: $44. Verdict: Sent back. I can’t be too mad that the stylist found something that basically already exists in my wardrobe. The Pixley Abriella Waffle Knit Cardigan, while awesome, is a near replica of a cardigan I already own. I probably actually like this one better, but I’m not trying to buy duplicates. Exhibit A: The Pixley cardigan. Such a great staple item! 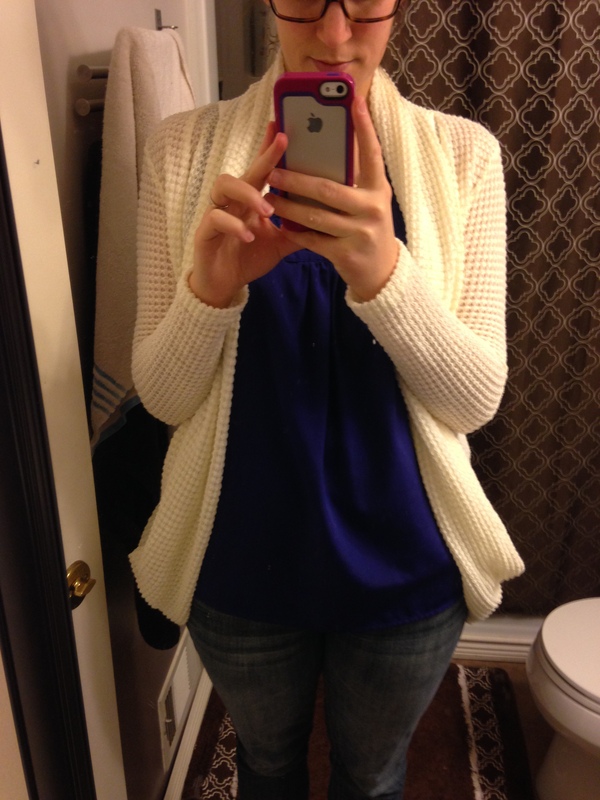 Exhibit B: Cardigan I already own, purchased at Old Navy like a year ago. So great, in fact, I already own one. You see what I’m saying. Again, the stylist nailed my style, but since I already own something nearly identical, I’ll be passing on the cardigan. I think you’re probably starting to see a pattern here, and unfortunately it continues. 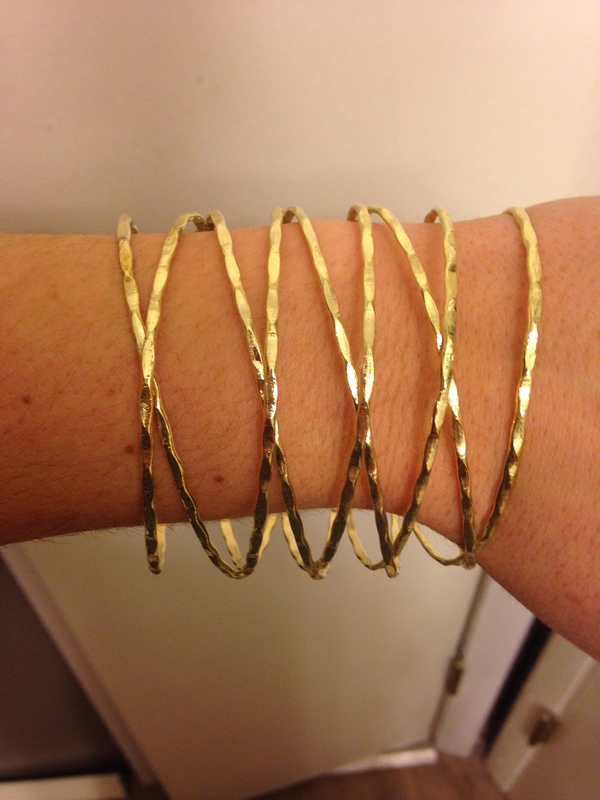 This cuff? Already own one. So I guess, good job Makela for hitting my style on the head? Well, almost. This shirt. What do I say about this shirt? It looked so cute in the box; the material so soft, the color nice and saturated, flowy like I like a lot of tops to be, and long enough in the back to pull it off with leggings. Oh and also designed to make me look like a small house. Pitchin’ a tent up in hurr. Seriously. 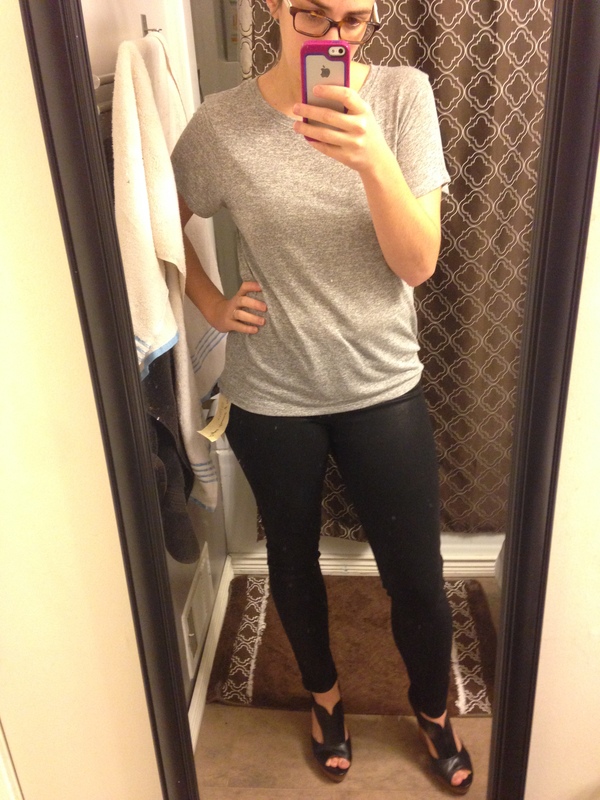 I know I made fun of my muffin top earlier, but in no way does this shirt help make things better. I look huge! My husband asked if there was a circus going on under this tent. I think the verdict is pretty clear; the only way I could see keeping this thing would be if I were in the market for maternity clothes. So there you have it — I won’t be keeping anything from this fix, but mostly because I already own similar items. I’m also still trying to figure out the right size to ask for in jeans, but I’m not giving up hope on them. There’s something just so much better about trying jeans on at home, with your shirts and your shoes, that it’s worth trying again and again to get it right. Better luck next time, Stitch Fix. What a cool concept but I’m so picky about my clothes and my body -nothing ever fits right!- so I don’t know that I could do this. Awesome that they got your style so well, but bummer that it was a no keeper! I’ve actually considered making a “stuff I already own” pinterest board so my stylist can avoid duplicating things I own! That’s a good idea, Crystal!